First off, this took forever for me to get through. If you are willing to wait, this is an awesome freebie from Green Mountain Coffee and Cafe Escapes! Head over to Facebook and “Like” Green Mountain Coffee. 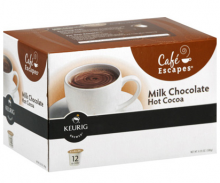 They are giving away a 12 pack of Cafe Escapes Hot Chocolate K-Cups. Click on the “Cafe Escapes Giveaway” on the left hand side if you don’t see the offer right away. Fill out your information and 12 FREE K-Cups will be on your doorstep within 2 weeks! Hurry, offer good while supplies last! Green Mountain Coffee: Try it for free!